*Welcome September!! I can feel the change in the air, with the trees turning, the air a little cooler, and autumn is right around the corner. 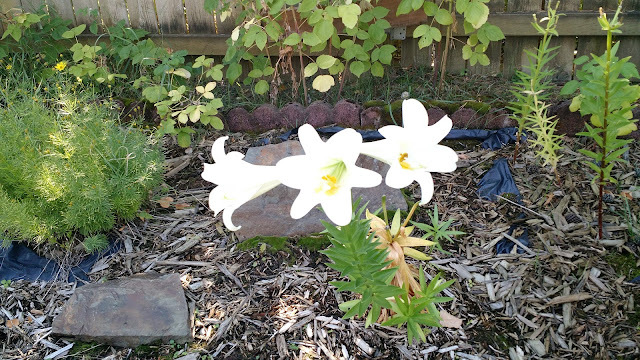 *Once special surprise out in my flower garden was the blooming of the Easter Lily. My secret pal at school, Julie Hanson, gave me this Easter Lily last spring. After it bloomed in our house at the end of April, Paul planted it in the garden in May. And it has resurrected, as an Easter Lily should, and has come back to life this week. To me, it is a sweet reminder of God’s love and redemption for us all. *Pastor David Langer came over this morning to talk to Paul and I and see how I was doing. It was good to talk to him about the grieving process, and he explained what I can expect to happen in the future, and we had a really good visit about Mom, and what I have been experiencing. We had a time of prayer at the end, and it was a great way to start off my Friday. Before he left, Pastor Dave asked if there was anything the church could do to help me at this time. I had to think of that a minute, and my response was, “Continue to ask me how I am doing”. For me, talking about this process, writing about it, communicating what I am going through has been a bit help in the grieving process. *I had a lunch date with my friend Carolyn Meade. We met for lunch at The Hill Street Depot, and enjoyed catching up. We used to get together regularly for breakfast or lunch, but, due to a variety of reasons, have been unable to see one another for quite a while. I am so glad it finally worked out to get together and visit today. We have both had quite the summer. Her husband Gordon was admitted into the hospital earlier this summer with an infection in his brain due to an abscessed tooth, and the infection caused him to be paralyzed. After a surgery to remove the infection, Gordon slowly recovered from his paralysis, and hopes to make a full recovery. Then I shared with her by summer, and it was so good to visit and get caught up. I love my times with Carolyn. *I found a video online that Josh McDonald of the Shoshone News Press filmed as the McConnell Hotel was being demolished in uptown Kellogg this morning. Here is the video if you would like to watch. *Later in the afternoon, Paul and I went over to Mom’s house and picked some tomatoes and one cucumber, and put a few things in the car to bring over to the house. Since we had so many fresh tomatoes, we decided to have BLT’s for dinner, and I made some fresh salsa. It tasted so good. *After finishing the book All the President’s Men, Paul and I sat down and watched the movie tonight. What a gripping story. *Through my conversations with Pastor Dave and Carolyn today, part of me realized I am not just grieving the loss of one parent. I think I am grieving the loss of my father as well. Even though he died 21 years ago, I am not sure I really properly grieved that loss. At that time in my life, we lived in Meridian, and Molly was five, Zoe was one and Cosette was nine months when Dad died. In the midst of Dad’s illness before he died, Paul’s Grandpa Paul Taylor also passed away. I just don’t ever remember taking the time to process everything, because I was so overwhelmed by the circumstances in my own life. But now, I am allowing myself to take it all in, and grieve the loss of Mom, the loss of Dad, the change in our family structure, the fact I no longer have a living parent. I actually welcome the tears that come when I least expect it. *There are many resources out there to help people grieve. One website I found was Journey of Hearts. I want to experience all grief has to bring to me. If I need to cry, I want to cry. If I am angry, I want to be angry. If I am overcome with sadness and depression, I want to experience that as well. There is nothing wrong with these feelings and experiencing these different levels of grief. They are good. They are part of the process. The process I welcome with open arms.